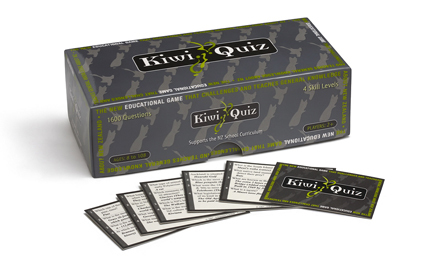 Kiwi Quiz has firmly established itself as the family game of choice when it comes to combining fun and learning. Spanning a wide spectrum of general knowledge questions about NZ, it’s as popular in the classroom as it is in the home. With 400 cards, 1600 questions & 4 different skill levels, players from 8 to 108 will be challenged and entertained for hours. Enjoy some fun family times together for ages 8 to 108! If you would like to order Kiwi Quiz direct, please click on the icon. For bulk pricing options, please contact us with details of your request.